Clubs: East Fife, Preston North End, Rangers and Partick Thistle. An excellent wing-half, James Scotland Symon played with Dundee, Portsmouth and Rangers. A large part of his nine year spell at Ibrox occurred during the Second World War, limiting his Scotland appearances to a solitary cap against Hungary in 1938. He also had the distinction of representing Scotland on the cricket field. In 1947 Symon embarked on a remarkable managerial career, starting out with East Fife. Under Symon the Methil side twice won the Scottish League Cup and were also Scottish Cup finalists. Symon earned a big move to Preston North End and led the Deepdale club to an FA Cup final in 1954. 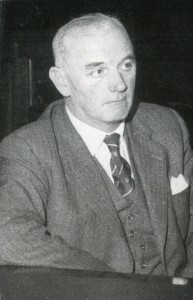 With his reputation soaring Scot returned to Ibrox to replace the formidable Bill Struth as Rangers manager in 1954. Between 1954 and 1967 he led the club to six League Championships, five Scottish Cups, and four Scottish League Cups. Under Symon, Rangers entered European competition for the first time, reaching the European Cup Winners’ Cup final in 1961 and 1967. On leaving Rangers he enjoyed two seasons as manager of Partick Thistle.